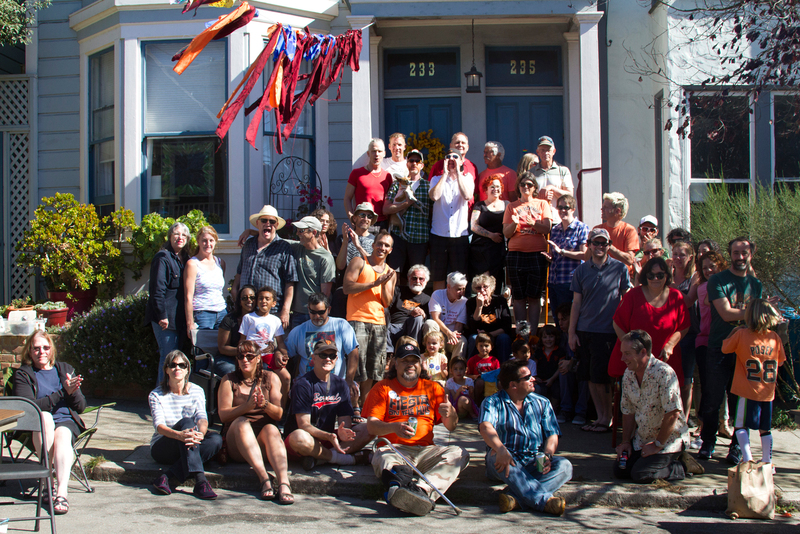 The Elsie Street Block Party drew neighbors together on September 28, 2013. Photo by Courtney Quirin. Simplicity. It’s the maxim behind many a success, and now San Francisco’s transportation agency has followed suit, streamlining the permit application for single-block party events and watching them multiply. With some help from a nonprofit, the San Francisco Municipal Transportation Agency (SFMTA) trimmed the 13-page application down to three pages in 2011, and since then the city has seen its highest number of block parties yet, with applications rising by more than 25 percent in the last two years. But making it easier to give a party doesn’t just mean more city-wide fetes. It also conjures up stoop-to-stoop cohesion that leads to coordinated community efforts to reshape neighborhoods into more livable and safer places. Though the length of the block party application has changed, the actual permitting process hasn’t, said Cindy Shamban, the sole SFMTA officer to issue block party permits in a job she has held for 21 years. Twice a month a conglomerate of city agencies, called the Interdepartmental Staff Committee on Traffic and Transportation (known as ISCOTT for short), reviews block party applications on a case-by-case basis, tailoring permit requirements to the individual needs of each block. Whereas the old 13-page application intimidated applicants and turned many away, the new slimmer version appears to be a swift process, attracting more applicants, Shamban says. Krehbiel said that easing the use of public spaces is key to kindling community. Once crystallized, a community then does “the work of the city” by increasing safety, creating better places for kids and families and even stimulating local economies, she said. The Elsie Street block party in Bernal Heights is a case in point. It was started seven years ago by Elsie Street resident Michael Nolan and the success of the first Elsie Street block party prompted residents to form a block party committee, which now has its own bank account and Facebook group. This committee, Nolan said, has “helped inspire communication,” creating a platform for orchestrated conversations that have allowed residents to take charge of their neighborhood. For example, to residents’ dismay, Elsie Street was once a popular hangout for feral cats. So as conversations of the feral cat issue trickled down the lane, several committee members stepped forward to institute a trap-and-neuter program that solved the problem. The committee also took the lead when speeding traffic at a nearby intersection reverberated concerns of safety down the block. Taking charge, several other committee members organized neighborhood meetings with local police about how to calm traffic. Similar situations are playing out across other San Francisco neighborhoods. The NOPA Neighborhood Association hosts two block parties a year. Combined with the association’s bi-monthly newsletter, the stoop-to-stoop cohesion created and reinforced at their block parties has been instrumental in cutting down crime and in getting the Grove Street Farmers Market up and running, members said. The corner of Grove and Divisadero, now the site of the farmers market, had been a crime-ridden spot and a string of shootings on that corner over a few-month span in 2007 was the last straw for NOPA neighbors. Wanting to bring “something positive” to the space as well as more eyes on the street, neighbors put their heads together and decided a community market could be a solution. They were right. Since instituting the farmers market, crime at that corner has been minimal. While NOPA isn’t necessarily a hotbed of crime, block parties have helped cleanse other neighborhoods that are. This year, Sunday Streets, a San Francisco nonprofit and street-party organizer, launched a series of single-block events called Play Streets. With the goal of helping neighborhoods with little resources, Sunday Streets held a Play Streets event on Ellis Street, between Hyde and Leavenworth. Unbeknownst to Susan King, the executive director, the stretch of block sits at the heart of drug deals in the Tenderloin. However, as kids and families poured out into the streets on the block party’s debut, residents couldn’t help but notice that something was missing — the crackheads. “This was the first time they were gone,” residents kept telling King about the absence of shady characters and drug deals during the Play Streets event. With the second highest population of children and the second lowest number of open spaces per resident, King’s block party activated one of the few available public spaces in the Tenderloin — the streets. “It really did create a space where people could come out and bring their kids,” King added. While much of the praise of block parties rests on anecdotes like Elsie Street, NOPA and the Tenderloin, the San Francisco Department of Public Health (SFDPH) has been quantifying the pros of block parties in a more scientific way. Listing block parties as one of 91 indicators in its Sustainable Communities Index, a system that guides anyone from city planners to community associations in developing “equitable and prosperous cities,” the department reports that the social cohesion block parties promote helps reduce crime and violence, thereby improving individual health. However, a neighborhood’s absence from the transportation agency’s block party database could clue us into a larger issue: cost. Let’s say you want to hold a block party in the Tenderloin, as did Sunday Streets. You better be prepared to fork over much more than just the application fee, which ranges from $154 to $473, depending on how early you apply before your event. While some blocks need nothing more than street barricades and road closure signs to host an event, ISCOTT requires communities on busier or dodgier blocks to hire off-duty police officers (who are paid overtime) and/or parking control officers to keep events safe. “That’s where the costs really started stacking up,” King said, referring to the Tenderloin event that required a police officer. Both King and Krehbiel see the fluctuating requirements and costs of block party permits as problematic. Neighborhoods with limited resources and ridden with crime need community events like block parties the most, King said. However, those areas also tend to be the ones where ISCOTT requires police officers — additional costs that community members often can’t afford. Great piece of written and video journalism, Courtney! Good information. We had a block party last year on our street in the Mission and just skipped the application because it was so tedious. Philadelphia could learn a few things about the positive impact of simplicity. Go Courtney!